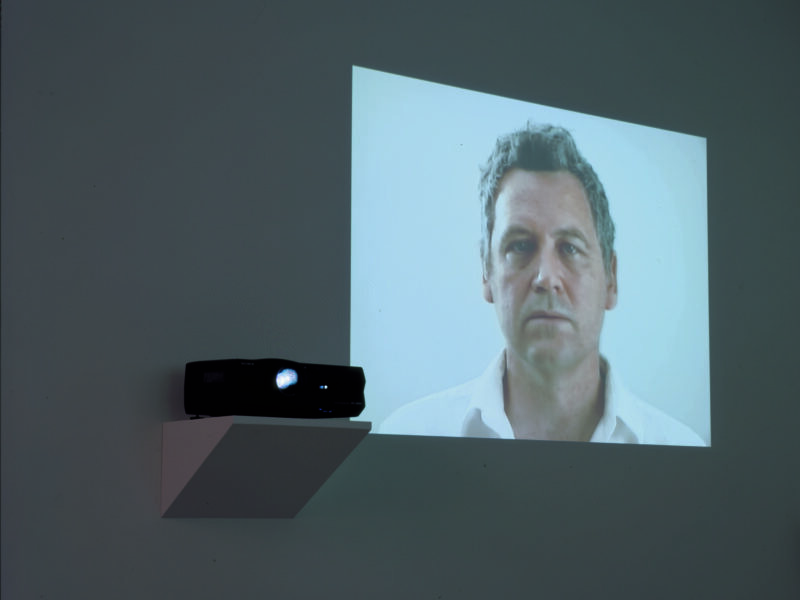 Two color video images are projected on opposite walls. 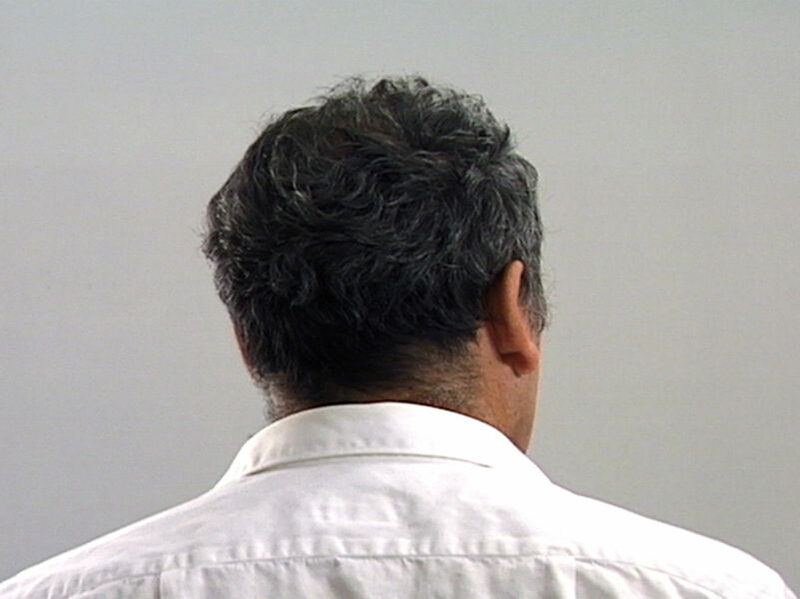 On one a face is saying the name “Gary;” on the other the back of the head appears. Looking at either image the projector of the opposite (other) image is mounted at the lower edge and adjacent to the image of the other (opposite) projector. Over and over again, the artist simply repeats his name, not particularly fast or drawn out and slow. There is no attempt to try and say it particularly differently or with any noticeable theatricality. Rather the focus is to get inside the word as if one could discover identity—where the name might become the person over time. With each articulation the word turns, shifts, and cuts a new “image.” There seems to be an equal chance of the opposite occurring—complete alienation as the name “Gary” morphs like any other word, mutating into pure sound in the very mouth of the one it belongs to. An example of this work was first exhibited as part of “A Name, A Kind of Chamber, Two Weapons & A Still Life,” a solo exhibition at the Barbara Gladstone Gallery, New York, New York, September 18 – October 30, 1999. Solo exhibition. Galleria Lia Rumma, Milan, Italy, November 18, 1999 – January 2000. 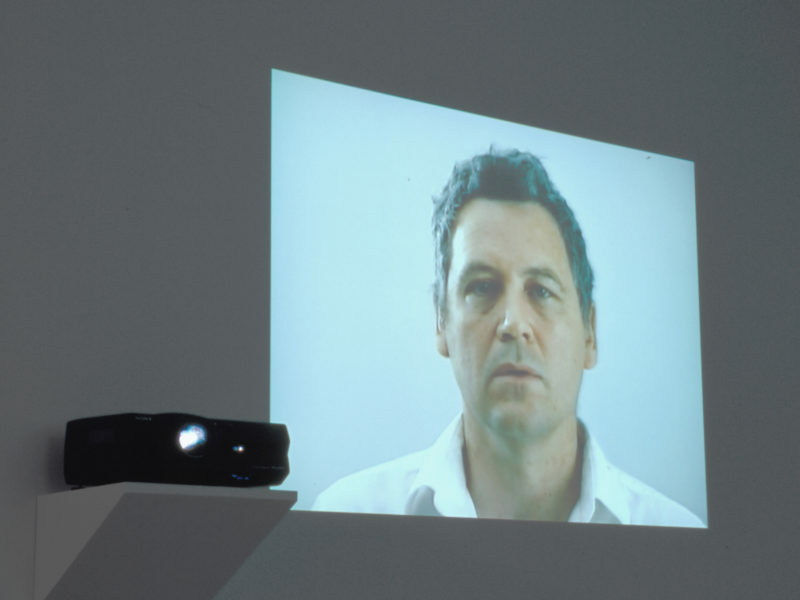 “Sound Video Film,” Donald Young Gallery, Chicago, Illinois, May 5 – June 10, 2000. Donald Young Gallery at Art 31, Basel, Switzerland, June 21 – 26, 2000. Quasha, George and Charles Stein. La performance elle-même in Gary Hill: Around & About: A Performative View. Paris: Éditions du Regard, 2001, pp. 6, 34. Gary Hill: Selected Works and catalogue raisonné. Wolfsburg: Kunstmuseum Wolfsburg, 2002, pp. 227. Quasha, George and Charles Stein. An Art of Limina: Gary Hill’s Works and Writings. Barcelona: Ediciones Polígrafa, 2009, pp. 424, 433, 586.